Looking back on a tumultuous year for Utah restaurateurs and diners. Needless to say, 2016 was a turbulent year by any standards. That was also true of the local dining scene. I don't recall a year when so many restaurants closed and morphed into new ones. Chefs bounced around like pinballs. Here are some of the highlights. In what I considered to be the biggest surprise of 2016, Forage closed. Originally created by Bowman Brown and Viet Pham, it was the most daring of eateries, offering wildly creative dishes that were always unique. Along with The Metropolitan in its heyday, Forage broke new ground and raised the bar for Utah diners. 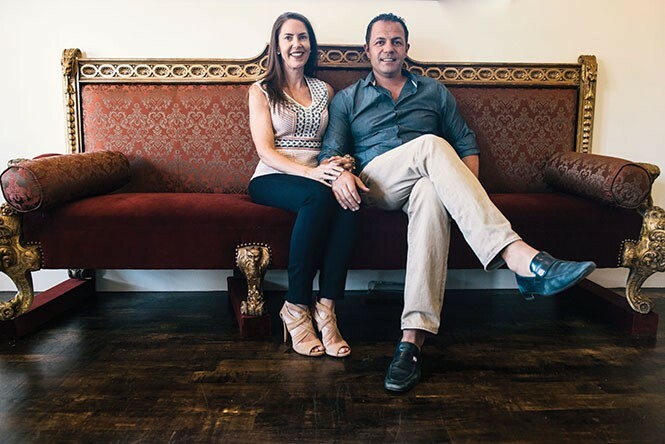 In its place, Marco and Amy Stevanoni opened Salt Lake City's Veneto Ristorante Italiano (370 E. 900 South, 801-359-0708, VenetoSLC.com)—a culinary homage to Marco's homeland and, in my opinion, easily the most authentic Italian restaurant in the Beehive. It's also unique insofar as it is a no-tip establishment. "There's no tipping in Veneto, so there's no tipping at Veneto," Marco once told me. Even as the tally of local Italian restaurants increased, we lost one in Vinto. I always liked David Harries' ode, décor-wise, to the famous cathedral in Siena, where he and his wife Deborah spent their honeymoon. Thrilling ambiance aside, their pizzas and heavenly homemade meatballs kept me coming back. This past spring, Vinto closed, and HSL (418 E. 200 South, 801-539-9999, Salt Lake City, HSLRestaurant.com) opened in its place by owners Briar Handly, Melissa Gray and Meagan Nash. Armed with a pantry of fresh, mostly locally procured produce, meats and such, Handly and fellow chef Craig Gerome treat guests to dishes as varied as General Tso's-style cauliflower and ash-roasted cabbage with fermented chili romesco, and their fabulous beef cheek burger. And the tables in town kept turning. Faustina—a longtime SLC favorite on 300 South—was raised (literally, the ceilings and roof were heightened) and became Stanza Italian Bistro & Wine Bar (454 E. 900 South, 801-746-4441, StanzaSLC.com). Stanza is a collaboration of restaurateurs Mikel Trapp and Joel LaSalle, who are also involved in Current Fish & Oyster, Luna Taquerìa, Trio, Oasis Café, Caffe Niche and others. Since it's both a restaurant and a wine bar, the owners wisely enlisted Jimmy Santangelo as their beverage director, and his pairing suggestions for dishes ranging from whole prosciutto-wrapped branzino to bucatini carbonara are always spot-on. Over at Current, Phelix Gardner took over the kitchen after leaving his position as chef at Finca. The Annex by Epic Brewing in Sugar House had been rebooted a couple times since opening in 2014, including chef Robert Angelilli moving on and chef Craig Gerome moving in. More recently, it went away altogether and was replaced with Mark Mason and Bleu Adams' Black Sheep Café (1048 E. 2100 South, Salt Lake City, 801-742-5490, BlackSheepSLC.com), which in turn followed the closure of their Blue Poblano restaurant. Confused? Me too. A beloved favorite of Park City locals since opening in 1972, The Eating Establishment (317 Main, Park City, 435-649-8284) was purchased, revamped and recently reopened by Modern Family star Ty Burrell and his Edison Alley Group. Another PC classic, Cicero's, bit the dust and has been completely gutted and made into Firewood (306 Main, 435-252-9900, FirewoodonMain.com). Most of the restaurant's menu items are cooked by owner/chef John Murcko and his crew on an eight-station wood-fired grill using an array of different woods. The restaurant opened just last week, barely making the 2016 cut. Back in Salt Lake City, one of our most cherished institutions, Fresco Italian Café, closed for business and was sold to restaurateur Scott Evans (of Pago, Finca, East Liberty Tap House and Hub & Spoke Diner), who reopened the spot as Trestle Tavern (1513 S. 1500 East, 801-532-3373, TrestleTavern.com). Here you'll find craft beers and ciders and Bohemian-inspired cuisine—dishes such as cabbage rolls, spaetzle and cheese, pierogis and goulash. Two downtown Asian eateries were shuttered and blossomed anew this year. Yellowtail Japanese Bistro—which had taken over the location that formerly housed Shogun—closed and became SoCo (319 S. Main, 801-532-3946, SoCoSLC.com). This Southern Comfort eatery whips up incredible stick-to-the-ribs fare, like fried chicken, hushpuppies and sensational shrimp and grits. Also impressive is their Southern-themed cocktails, such as the Daisy Duke or Lynchburg Lemonade. A few blocks west, Ekamai was sold to husband and wife Wichai and Yupin Charoen, who turned the tiny space into Laan Na Thai (336 W. 300 South, 801-363-2717, Facebook.com/LaanNaThai). In addition to classic dishes many of you would be familiar with, they also serve several lesser-known specialties from their homeland in northeast Thailand. Cucina (1026 Second Ave., Salt Lake City, 801-322-3055, CucinaDeli.com) has been around since 1995, but underwent significant changes in décor and cuisine when talented young chef Joey Ferran left Log Haven to take over Cucina's kitchen. The result was a tantalizing new evening tapas menu, along with monthly wine dinners that routinely sell out. One of my favorite new restaurants of 2016 was family-owned-and-operated Sicilia Mia (4536 S. Highland Drive, Salt Lake City, 801-274-0223, Facebook.com/Sicilia-Mia). This is a place where everyone is Italian for an evening, as they're enveloped in the warm hospitality of the owners. A crowd favorite—and a real showstopper—is the spaghetti carbonara, wherein a large, hollowed-out wheel of Parmigiano-Reggiano is rolled to the guests' table and the dish is prepared tableside, right in the Parm wheel. Other new SLC eateries that fed me well this year include Mollie & Ollie (159 S. Main, 801-328-5659, MollieandOllie.com), the recently opened Table X (1457 E. 3350 South, 385-528-3712, TableXRestaurant.com) and Este Deli (1702 S. Main, 801-487-3354, Facebook.com/EsteDeli1)—where you'll find damn good cheesesteaks, East Coast-style hoagies and an outrageously tasty Italian-style roast pork sandwich with sharp provolone and broccoli rabe. Finally, it saddened so many of us to learn of the tragic death of John Williams this past spring. He and his Gastronomy Inc. partners opened The New Yorker, Baci Trattoria and Market Street restaurants, among others, and paved a path for fine dining in Salt Lake City. He was also an ardent supporter of the local art community and his charitable work was well known. John, we miss you.